Eko-konnect joined International Telecommunication Union (ITU) to celebrate the International girls in ICT day on Thursday, 26th April 2018. The event themed “Decoding my Future – The Code in my Future” was aimed at encouraging secondary school girls to pursue ICT related careers by exposing them to new trends in technologies that can be applied in various industry sectors. The event was held at the Department of Computer Science, University of Lagos. Pupils from various secondary schools (Mbari Mbayo Secondary School, Reagan Memorial Baptist College, Yaba College of Technology Secondary School, St. Timothy’s College and Federal Science and Technical College Yaba) came with their ICT teachers to the event. Guest speakers included Dr Florence Oladeji, from the Department of Computer Science, University of Lagos, Aisha Bello (Django Girls Lagos) and, Dr Olamma Iheanetu, Department of Computer Science, Covenant University. Each speaker relayed their experiences as female professionals in ICT and the impact that emerging technologies will have in different sectors of the society now and in the near future. 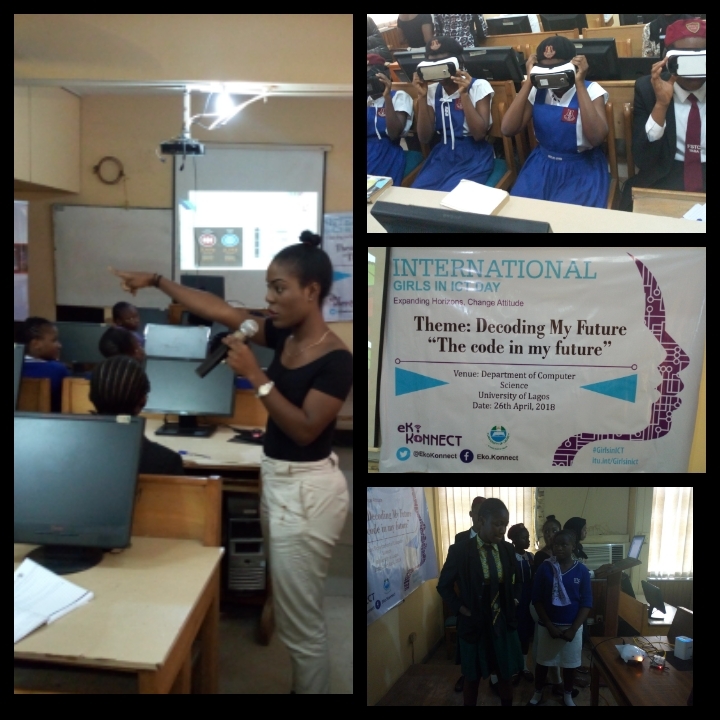 Demonstrations by Imisi3D showed how virtual reality using headsets can be used in education while Eko-konnect staffs, Kafayat Adeoye and Uffa Modey demonstrated how voice recognition software using Amazon’s Echo Dot was engineered. The girls were introduced to Raspberry Pis and a demonstration of how Raspberry Pi’s can control a Finch Robot with Python code was shown. In addition the girls saw how raspberry pi’s could be used as a voice recognition device after integration with Google assistant voice SDK. Goodness Agboh, Programs Officer Eko-konnect closed the event by promising the girls present that Eko-Konnect woud liaise with their schools to continue activities to help them and learn more about ICT in innovative ways through the Eko-Konnect ICT Girls Club.